Learning how to tune your guitar, and keeping it in tune is one of the most important technical elements of playing the guitar. No worries though, learning to tune your guitar is as easy as 1,2,3. First of all, watch our video tutorial on how to tune a guitar, it will show you the basic technique with an electric tuner, and without one as well (if you want to tune by ear). To tune by ear, you'll need a reference note, for which you can use our online guitar tuner. Tune upwards - The correct method of tuning is to go a bit below the desired pitch (loosen the string), than go up to the right pitch (tighten the string). Doing this will help avoid the string getting out of tune, and becoming flat during play. Your final twist of the peg should always make the string tighter. Of all these guitar tuning tips, this is most important since so many people get it wrong. Guitar strings stretch and shrink when exposed to heat and cold. Avoid leaving your guitar in extreme temperature conditions, or if you do, make sure you retune before you start playing again. Once you start playing at gigs where you play lots of songs, check your guitar's tuning between songs. Most effect pedals have built in tuners for this purpose, which comes in very handy. There's nothing worse than a "professional" musician who is out of tune. After getting new strings, you'll need to tune more frequently until your strings stretch into place. If your electric guitar has a tremolo arm fitted onto it, you'll need to tune more regularly, as the tremolo stretches your strings when in use. If you are tuning in a noisy environment, use a tuner that can be plugged into your guitar. Most good electronic tuners have both an internal microphone and the ability to be connected to a guitar with a jack cable. Turn your tuning pegs carefully. 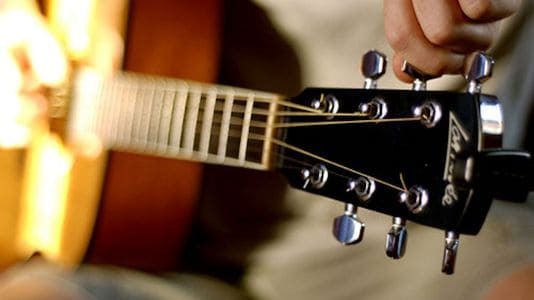 If you play your guitar regularly, you'll only need to slightly retune without larger twists of the pegs. Don't leave your guitar with its neck resting on the ground. The tuning pegs will invariably brush up against the surface and turn by accident. Get a guitar stand! It's best practice to tune your guitar every time you pick it up. Tuning with your ear is good and will help you develop a musicians ear, so once you've played enough and can hear pitch alterations, first tune by ear, than maybe double check with an electric tuner. By keeping the above advice in mind, you'll always have a guitar thats in tune. If you're a beginner guitarist, get an electric guitar tuner, it'll make life a whole lot easier. Thanks it’s very helpfuk article! The always tune upwards bit is good advice. It’s definitely a best practice to drop a string down below your target note and then tune up to that note. I would also second the “tune by ear” bit, at least as much as you can. It definitely helps you musically, but it’s also just quicker. No one wants to pick up a tuner every time they want to play. If you do want to use one, I’d advise getting an amp that has one built in. Indeed, one of the most important technical stuffs on guitar playing is tuning the instrument correctly because no matter how good one plays the guitar if he or she uses an out of tune guitar, everything becomes a disaster. These tips you have shared are very useful especially for beginners. Thank you for sharing your knowledge. Until one learns to tune their guitar manually they can always use the principle of beats to tune their stringed instrument. That is much better than using electric tuners since it slowly does develop your ear too.